New Samsung internal solid state drives are headed your way in October promising blazing fast data transfer rates of up to 6 gigabits per second thanks to the SSD's Serial ATA (SATA) 3.0 interface. Samsung's new SSD 830 series will come in 64, 128, 256 and 512GB storage sizes and will be sold as a 2.5-inch drive. The full upgrade package for the SSD 830 also comes with a bracket to fit into 3.5-inch desktop PC slots and Symantec's Norton Ghost software. 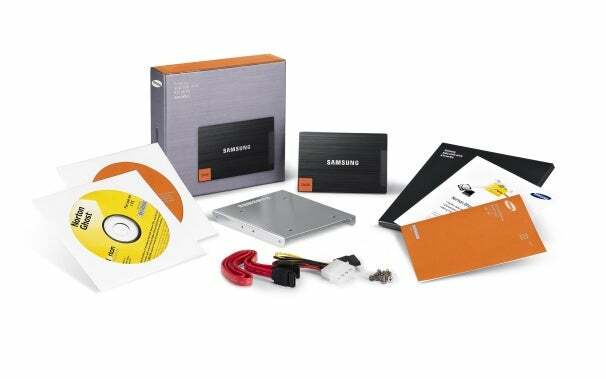 Samsung will also offer a notebook upgrade package that includes a USB to SATA adapter cable. Pricing was not announced. This is Samsung's second SSD announcement in as many weeks. The company previously announced the PM830 SSD, which appears to be the OEM version of the SSD 830 announced Wednesday. The PM830 is available to computer makers now and comes in 128GB, 256 GB and 512GB sizes. During the PM830 announcement, Samsung said the drive supports sequential read speeds of up to 500 megabytes per second and write speeds of 350 MB/s. It's not clear if the SSD 830 will support the same read/write speeds or perhaps be even faster. Samsung said the PM830's performance would reduce a computer's boot time to about 10 seconds and let you transfer up to 5 DVD video files in less than a minute. The PM830 also features AES 256-bit data encryption, presumably the SSD 830 will do the same. Samsung's new SATA 3.0 SSD drives follow similar announcements by Intel in March with its SSD 320 Series and Sandisk's U100 and iSSD drives in May.